We have all seen images like this before. A photograph of photographs. A wall of missing or deceased men, women, and children remembered by little more than their photographic residues. Once they were here to be photographed, but now they are not. All that remains are these images. A visual aide-mémoire to what once was but is no more. 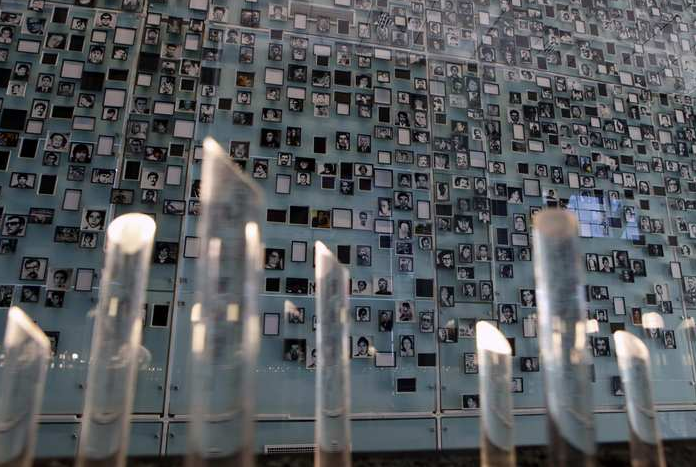 The photographs here represent the thousands who were tortured, murdered, and imprisoned in Pinochet’s Chile, but it is no different in kind from the Holocaust Museum’s “Tower of Faces” and other such memorial installations. One of the things that distinguishes such photographs (and the installations that they represent) is the anonymity of the individuals being remembered. And even when a name is available, it is little more than a verbal marker that designates the face portrayed, but tells us nothing of the person being memorialized, of who they were: their successes and failures, their joys and sorrows, their personal conceits and virtues, etc. In an important and somewhat ironic way, that is precisely the point. What makes photographs such as the one above notable is how they aggregate a mass of individuals as a collective, not by metonymic reduction of the many into the one, but by underscoring the sense in which the whole is more than the sum of its parts. And the normative impact of that is palpable, all the more so since it marks a crime that has no name. The torture and murder of any individual is unjust, to be sure, but here the injustice is magnified literally beyond comprehension. To begin with, many of the images are simply beyond the range of ordinary human vision, both too high and at an oblique angle from the floor, making it very nearly impossible to register the visual representation of any individual with any real precision. And yet, even though many of the photographs cannot be easily registered there is no doubt that they are to be seen, just as those recorded in the images were once there to be seen. But more, there is something of the quality of an optical illusion: Try to focus on an individual face and you are almost immediately lost in the collage of images that demarcate the sprawling but vaguely ordered mass, look to the whole so as to make sense of its collective order and your line of sight is drawn to individual faces, and then back again. The overall effect is to underscore the sheer impossibility of taking in, let alone understanding, the magnitude of the crime imagined and being remembered. And therein lies, at least in part, the power of the photographic image: to help us show—and perhaps to see—when words are simply not up to the task.